ST. JOSEPH — Standing before his classroom on a Wednesday afternoon in early February, Ted Hendricks writes a story problem on the white board. It’s only the third time this personal finance class has met this semester, but his students are about to learn one of life’s hardest lessons: How to save money. Hendricks’ personal finance class, which he’s been teaching for more than 20 years, seems to always draw interest from students each year. College graduates these days are considered the most tech-savvy of all time. However, many have trouble balancing their own checkbook. A new study conducted by George Washington University confirmed millennials have a low level of financial literacy, which could hurt the economy. The study broke down the financial characteristics of more than 5,500 people born between the early 1980s and the mid-1990s. Of the group of millennials surveyed, only 8 percent answered five out of five questions correctly and 24 percent answered three correctly. With this dilemma in mind, more schools are looking to add financial courses to their curriculums. When Hendricks came to St. Joseph High School, he inherited a year-long records keeping class. Hendricks tweaks the curriculum for his finance class every year because the material is ever-changing. He hasn’t used the book that comes with the course for a few years because there are better resources out there. Fifth Third Bank provides the class with a financial literacy course that was created by Dave Ramsey – the guru of personal money management. Hendricks said he uses Ramsey’s material supplementary with his curriculum. At Bridgman High School, students are offered business math, accounting, business management, economics and college economics. Among those financial classes, Principal Chris Machiniak said, the one that seems to teach more about real-life experiences is business math, which incorporates Ramsey’s many teachings. The year-long class has become a popular choice among Bridgman students the last couple of years, as it doubles as a senior math class. Berrien Springs High School is in the process of evaluating its curriculum, and Principal Ryan Pesce said they are looking into adding more financial classes. Pesce said the school added a personal finance class in 2011, about the time the state required schools to provide math classes for seniors. The high school’s accounting class was cancelled, but Pesce said the district is trying to bring it back. Machiniak said he believes students should learn the basics of the financial world in middle school, especially when it comes to checking and savings accounts. As far as the stock market and investing funds, Machiniak said it’s best to wait until the later years in high school to ensure students can comprehend everything. The concept of time is an important thing to remember in Hendricks’ class. He preaches to his students nearly every day that time can be the biggest factor on an investment’s return. When Hendricks goes over a story problem with students during their first week in class, many make a mistake by not adding an extra year into the equation. The story problem proves it can never be too early to begin saving. Some students don’t take Hendricks’ class because they are not interested while others simply have too many commitments and a loaded class schedule. Lakeshore High School Principal Brad Brunner said the personal finance class uses the Ramsey curriculum, and it has become a popular choice among students. However, Brunner believes the trick to being more fiscally responsible comes from other math classes as well. While reading a report from the Wall Street Journal, Brunner discovered the people most responsible with their finances continue to take regular classes in high school and college – regardless of their major. The simple building blocks of algebra and calculus go a long way, Brunner says. What remains to be the biggest challenge is getting students to understand the value of a dollar. Among the other findings in the GWU survey, 30 percent of millennials have overdrawn their checking accounts, and 42 percent used “alternative financial services” such as pawn shops, auto title loans and payday loans. As of today, four out of five millennials have major debt. Millennials’ heavy debt burdens are causing them to compromise their future security. Some 17 percent of those with a retirement account took loans against it in the past year, while 14 percent took out a hardship withdrawal. Schools are already teaching the newest set of students known as Generation Z or Boomlets, for those born after 2001. Mackenzie Holden and Dylan Lawrence are both St. Joseph seniors who took Hendricks’ class last semester. Holden said she expected the class to go over the basics on the stock market, but was surprised to learn about things like building one’s equity and buying a car. Lawrence was recommended the class by his father, as both his older siblings took the class and have benefited greatly. Both students said they feel more comfortable with student loans looming and are prepared to buy a car or rent that first apartment. That comfort was established through a more hands-on lesson with Hendricks. At one point, Hendricks had students create a life page. It had them examine what they needed as an adult and where they wanted to be at a certain point in life. Hendricks said the state is moving in the right direction as they are considering a mandated financial literacy course. The course hasn’t been put in place, but Hendricks remains hopeful when the state revamps graduation requirements. One dead after residential carbon monoxide leak in Jefferson Twp. EDWARDSBURG — One man died and five people suffered injuries Friday in an apparent carbon monoxide poisoning in Cass County, the Cass County Sheriff’s Office reported. Cass County Central Dispatch at 5:30 a.m. heard from a caller who felt dizzy, faint and exhibited shortness of breath. Life Care ambulance was dispatched to the home along Indigan Lane in Jefferson Township. Upon arrival, deputies found multiple victims suffering from apparent carbon monoxide poisoning. Sheriff Joseph Underwood Jr. said medics checked the house and found five family members inside. Elizabeth Weston-Hammang, 41, David Hammang, 46, and three children ranging from 3 to 5 years old, all suffered from poisoning. These five family members had been on the first and second floors of the house. Medics found Andrew Weston, a 43-year-old from Columbus, Ind., in a basement bedroom. He was unresponsive and pronounced dead on scene. A Cass County medical examiner investigator was called to the residence and an autopsy is pending to confirm the cause of death as carbon monoxide poisoning. Weston was found near the suspected source of the poisoning, police say. The initial investigation indicated the source may have been an enclosed pool heating/boiler system. The pool room and equipment room is attached to the basement. Underwood said the investigation is ongoing. Columbus Indiana Police assisted in notifying Weston’s wife, Jennifer, of his death. Edwardsburg Fire Department responded to the scene and cleared the residence of the carbon monoxide by venting the house. Life Care Ambulance was assisted on scene by Edwardsburg Ambulance and SMCAS Ambulance. The Hammang family was transported to hospitals in South Bend. LANSING — There’s been much discussion over what the true intent is for House Bill 4540. HB4540, commonly referred to as the “pipeline secrecy bill,” would allow energy companies to conceal information about oil and gas pipelines, high-powered electrical lines and other critical energy infrastructure from both terrorists and the public. The bill was introduced by state Rep. Kurt Heise, R-Plymouth Township, back in May 2015. Discussion of the bill had fallen off until recently, when the Flint water crisis began making national news. State Rep. Al Pscholka, R-Stevensville, said the bill’s main purpose is to keep terrorists away from the state’s energy infrastructure – not residents or the media. Pscholka said the water lines wouldn’t fall under the bill’s criteria, as residents could still visit their municipality’s town hall to be shown the schematics of the city’s lines. The bill sits in the House Committee on Oversight and Ethics. HB4540 is not on the fast track either, as Pscholka said there appears to be no support or opposition on the bill’s analysis report within the House. Critics of the bill have said it protects oil and gas companies from public disclosures about safety and other records. The bill would be exempt from disclosure under the state’s Freedom of Information Act information about existing and proposed energy infrastructure. State Rep. Dave Pagel, R-Berrien Springs, said he hasn’t had a good chance to review the bill because it hasn’t gone through committee yet. However, Pagel agrees the bill would not affect the public’s information access to water pipelines. While the bill has not entered Michigan’s Senate, state Sen. John Proos said he has kept an eye on it. Proos, R-St. Joseph, said the bill would no doubt come his way as he is the vice chairman for the Energy and Technology Committee. The bill was last heard before the Natural Resources Committee in December 2015. Proos said the bill has been through many iterations, as the bill’s history shows eight different drafts from the original bill of introduction. BENTON HARBOR — Diana King found her place at Whirlpool Corp. when she attended an event put on by one of the company’s oldest employee resource groups. Years later, the training analyst became one of three co-leads for the Whirlpool African American Network after her first Jazz Night. 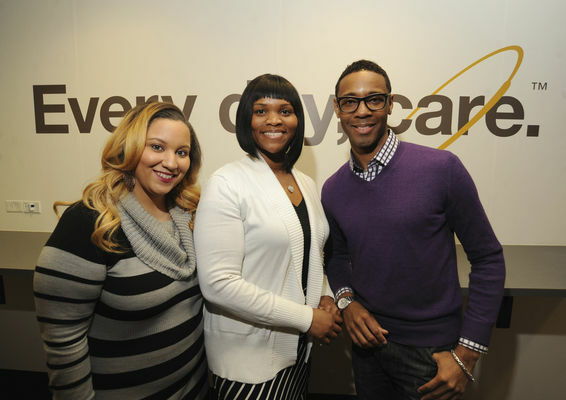 The group, which serves as a platform for the home appliance maker’s African-American employees, was created in 1998. The whole premise behind the network is to provide an atmosphere within Whirlpool and a culture within the company that supports each demographic. Jazz Night is the network’s capstone event for Black History Month. Employees and members of the community are invited to the annual event, which includes a formal dinner, a performance from a jazz band and a chance to recognize a few organizations in the community. This year’s Jazz Night is Feb. 27 at the Mendel Center. Those interested in attending can email the network’s co-leads at waan_erg@whirlpool.com. The network sends its information to more than 250 people in the Twin Cities area. From an active member standpoint, the network has 25 involved with its events. King said one of the main reasons an employee should join WAAN is for the welcome mat it lays out. One of the network’s key focuses is community. Burton said one of the easiest ways of discovering the Twin Cities is connecting with WAAN members – since some members are originally from the area. Ervin Poncho Eddie, a brand manager for Whirlpool and community lead, said the network was a good place for him to stay in touch with the community he was born in. Eddie returned to corporate from New York in 2012, after his career with Whirlpool began as an intern. The Benton Harbor native came back and immediately was immersed in WAAN. As one of the oldest employee resource groups, changes have been made, Burton said. Over the years, they evolved the type of initiatives they have held. In the coming years, Burton said she wants to see an increase in the network’s membership. She said it also would be nice to see an increased collaboration with other employee resource groups. 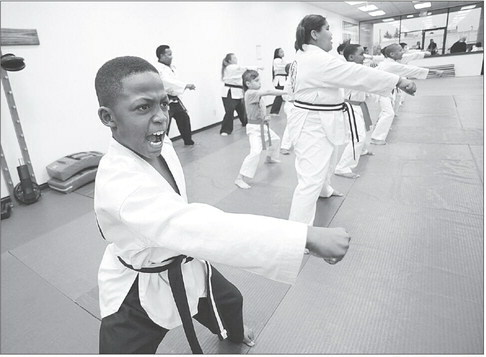 BENTON TOWNSHIP — Inside a taekwondo studio that rests amid various outlets within Pipestone Plaza, Donovan Frazier and Marlajah Mullins put in the work they need for a better life. It’s not just the leg kicks and palm attacks that they are practicing at the Benton Township dojo. They’re learning how to stay on the correct path in life. While the two have been in a similar situation, their personalities could not be further apart. Donovan, 11, addresses his superiors with his chin up accompanied by a “yes, sir.” Donovan struggled to keep his grades up before taking classes at R.E.A.D.Y. Taekwondo from Grandmaster Al Smith. Since he began his training, Donovan’s study habits changed and he began to pull in all A’s on his report cards. Marlajah, 10, is shy and softspoken. She, too, was struggling in school, but was also forced to deal with bullying. Both earned their recommended black belt, which is one step away from gaining a first-degree black belt. While Donavan and Marlajah have come a long way in their training and school work, both still struggle to pay dues for taekwondo lessons. Smith set up an arrangement with his students, which required them to bring in report cards with good grades before they were allowed to test or go to tournaments. The two soon improved in the classroom and on the mat. “Even though I would reduce the rate, (Marlajah’s’ mom) would sometimes have to go months without having to pay anything,” Smith said. “It was a real strain on her. So, I told them to bring me a good report card. I needed to see behavioral improvement, and that I better not hear about any fights in school. There are myriad costs involved with each student, which includes getting their rank promotions, uniforms and entering into tournaments. R.E.A.D.Y. Taekwondo does get funding from the Upton Foundation and Berrien Community Foundation. However, these costs began to stack up and Smith, who has a ninth-degree black belt, could only do so much. That’s where Bob Lemyre came in. As a co-lead and one of the founders of the Whirlpool Veterans Association, Lemyre approached Smith with the interest of sponsoring a few students. Smith chose Donavan and Marlajah, based on their dedication to the sport and the financial strain their families were under. Lemyre initially found out about the children through a Michigan Works employee who was familiar with Smith and his dojo. Once he heard the grandmaster was also a veteran, Lemyre decided to pay Smith a visit. After two sessions, Lemyre was impressed. As a result, the WVA would collectively sponsor Marlajah while Lemyre and his wife sponsored Donovan. “The approach (my wife and I) took was, instead of giving each other Christmas presents for the year, we took the money and put it toward paying for Donovan,” Lemyre said. Toward the end of 2015 – right before Christmas – the WVA made it official. The two were given a sponsored certificate during a special ceremony stating they wouldn’t have to worry about paying for classes. Both were surprised and overwhelmed. 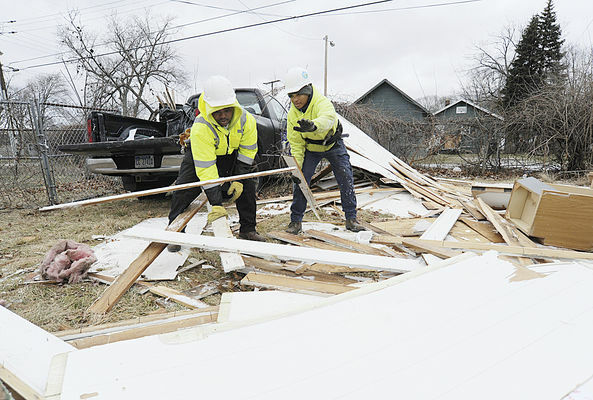 BENTON HARBOR — Despite the cold temperatures, several young men and women spent their Thursday tearing down remnants of a Benton Harbor house. These trainees were there to remodel a home on Pearl Street as part of Kinexus’ YouthBuild program. The house, which was acquired from the Berrien County Land Bank, is being remodeled for a local low- to moderate-income family with a completion date set for the spring of 2017. Benton Harbor resident Leqiesha Wright was in the house’s bedroom dismantling portions of the drywall, while being careful not to tear out anything that was in good condition. She said the training she had gotten helped in more ways than one. Wright said she entered the program to get a better feeling of what construction was – especially because her grandfather had worked the profession for years. When the U.S. Department of Labor Employment and Training Administration gave Kinexus a $1.1 million grant in September, the Benton harbor-based nonprofit chose to use that money for its YouthBuild program for the next three years. Kinexus has been executing the grant through its Bridge Academy, which is a vocational training center dedicated to preparing refocused youth that range in age from 16-24. Stephannnie Harvey-Vandenberg, general manager of the Bridge Academy, said the YouthBuild program has been helping young adults since 2007. In addition to Edgewater, Harvey-Vandenberg said Lowe’s and Home Depot donated construction material to the cause. Larry Jackson, construction manager of the YouthBuild program, said he and the 15 to 18 trainees began chipping away at the house about two weeks ago. Trainees will be expected to renovate the interior and demolish all the drywall on the walls and ceiling, while replacing the electrical, plumbing and heating systems. With new windows installed, the crew will do some landscaping and concrete work. The program had an open house in the beginning where trainees were assigned a specific room to write down what all needed to be done. They proceeded to hang posters in each room, which listed everything that would be renovated. With another 18 months to get the house refurbished, Jackson said they will work on it three to four days every week until they reach that goal. Once done, the house is put up for sale. Xavier Norman, who is originally from South Carolina, was taking out chunks of wall paneling Thursday afternoon in the living/dining room of the home. Norman said he has been doing this work since he was a kid and jumped at the opportunity to take part in the program. STEVENSVILLE — Lincoln Township firefighters scrambled Thursday to rescue a dog that fell through the ice at Grand Mere North Lake. Firefighters responded to a 5:30 a.m. call about a 7-year-old cattle dog named Bessie that was found in 4 feet of water, about 100 feet off shore. The dog was eventually saved and appeared to be unharmed after she was dried off and warmed. Upon arrival, Fire Chief Ron Burkett called for assistance from the St. Joseph Department of Public Safety for ice rescue suits. Lt. Joe Ehrenberg arrived on scene, where firefighters rigged ropes and a basket to get the St. Joseph lieutenant to the dog. The rescue took about 20 minutes to get Bessie to shore and back with her owners. Burkett said it is believed the dog was in the water for nearly an hour. The dog’s owners told firefighters she never ventures out toward that area, so they went looking for her when she didn’t come back to the house after 20 minutes. All units cleared the scene by 6:15 a.m.